The Serenity Angel collection pairs the spirit and grace of the feminine spirit with the power of words. I've designed these angels as spirited messengers of goodwill and inspiration for you and your circle of family and friends. The images shown are a sample of the variety available in the Serenity line. New designs are continually introduced. The Serenity Angel Collection can be purchased from a retailer near you, or you can check my links page for some online sources. 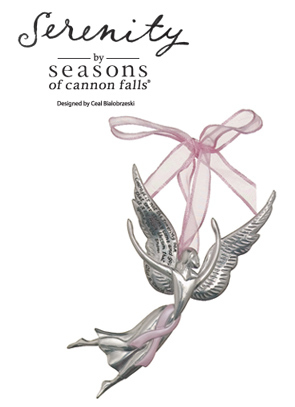 For Serenity wholesale inquiries, contact Seasons of Cannon Falls or call 1-800-776-2075. Serenity by Seasons of Cannon Falls, Inc. © Midwest. Exclusively designed for Midwest by Ceal Bialobrzeski.